Heaven News May 3, 2009 - Europe, here we come! Welcome, Moldova! We are so happy to welcome another country that has come to Heavenletters for the first time! Not only is Elizabeth Cusova our first subscriber from Moldova, right away she started translating Heavenletters into Russian! New country and new translator all at once! We are blessed. Exciting News -- New European Godwriting Tour! Then other active Heavensubscribers from Italy pitched in. Berit Delaini who has been like an angel to Heavenletters, filling any need we have – came forward. Patrizia Massi (Pitta) who makes the Heavenletter Spiritual Community Forum sing, rushed with her support, and Paula Launonen, Heaven’s stellar Italian translator (Paula was our very first translator) connected us with an angel, Magda Cermilli. Magda is a longtime Heaven subscriber who presents http://www.Lightworker.it It turns out that she also professionally organizes workshops in Turin, Italy, and would like to do this for us. Turin, incidentally, is known as the spiritual capital of Italy. Magda is quite sure that we will have sixty people attending the workshop. Thank you, Magda. Then Engin Vural, long-time angel translator from Turkiye, sought out two subscribing angels, Jale Katalan and Lale Kulahli of http://www.sifacemberi.com/ who also organize spiritual workshops. We will have a Godwriting workshop in Istanbul as well! Thank you, Jale and Lale! But that’s not all! Stefan Gracher, one of Heaven’s German translators, who is visiting in Mexico right now, will look for a good organizer for a workshop in Germany as soon as he is back. And, of course, we will also contact the two European publishers, Panos Axiomakaris of Greece, and Monica Visan of Romania, about giving workshops in their beautiful countries. Both Panos and Monica are well-known in their countries and have a substantial following who regularly attend their presentations. Meanwhile, Heaven’s hero, Heaven Admin, offered to carry my luggage! Don’t you love how Heaven Admin puts things? Carry my luggage indeed! He will also will be a great boon to the this European Tour. Everyone has wanted to meet this magical Santhan who has made Heavenletters his own. As soon as dates are confirmed – this will be soon -- we will send out a special edition of Heaven News. We’re anticipating that the European Tour will be in September, just prior to the Oneness Journey across the U.S. and down to Argentina. Below are photos of two workshops. The first photo is from Romania. The second is from Minden, Nevada. If you would like to see more of the 2006 Godwriting Workshop tour in Greece, Germany, and Romania, start here with Athens: http://www.godwriting.org/godwriting/athens.htm and keep going! And if you live in a country in Europe, and you would like to sponsor a workshop, please let us know right away. If you would like to help in Italy or Turkiye or know you would like to attend a specific Godwriting workshop, we would also love to hear from you. Actually, wherever you live, we would like to hear from you! Press the Add Comment link under the text of this Heaven News. That will take you to a box where you can type in your comment. Angels Spreading Heavenletters - how far it goes, nobody knows! Thank you, Shahid Khatai, for another great Youtube presentation! Thank you, Micheal Teal, for writing a great review of the Heaven book and posting it on your Shelfari book site! 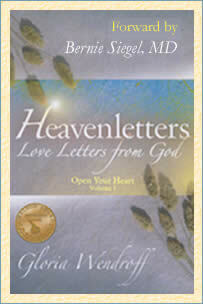 Please know how much we appreciate your reading Heavenletters, sharing them with your friends and families, and bringing more readers and subscribers to Heavenletters. It is our understanding that, by virtue of reading Heavenletters alone, we are contributing to higher consciousness and peace in the world. You are an essential part of Heavenletters. We hold hands in this together.